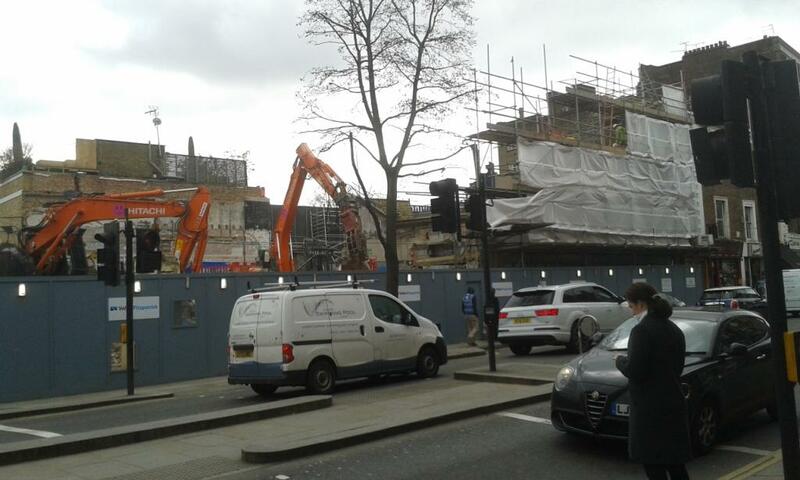 I had something different in mind for the blog this week but on Monday evening I saw a picture tweeted by one of the people I follow (sorry I think I know who but as is often the way I couldn’t find the tweet again) showing the demolition site of the Cinema on the corner of the King’s Road and Old Church Street. We’d glimpsed the work in progress already but yesterday my wife and I went down there so I could take a couple of snaps on my phone (in case I never got around to paying a formal visit with the Local Studies camera). With the mid-morning traffic and the passers by, conditions weren’t ideal for making a historical record but here are a couple of them anyway. 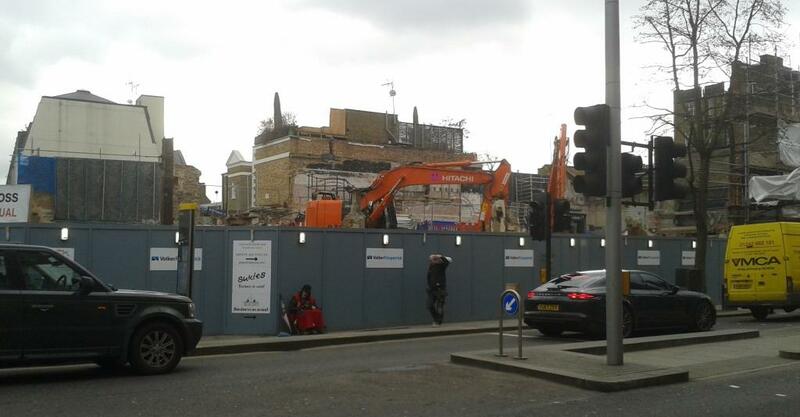 I like to take a look whenever a prominent building is demolished, not from a love of demolition sites (although I do like those) but because demolition reveals the backs of other familiar buildings and views you’ve never seen before. Behind the boards a mechanical digger chewed at brickwork like a large animal stripping a tree. The site is pretty large of course. 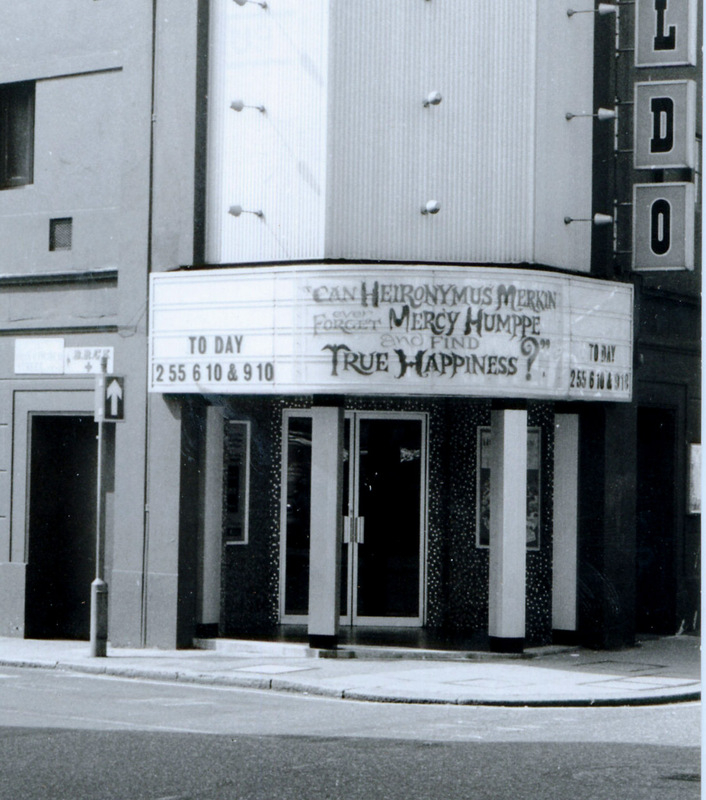 The cinemas of our collective memories were often huge. 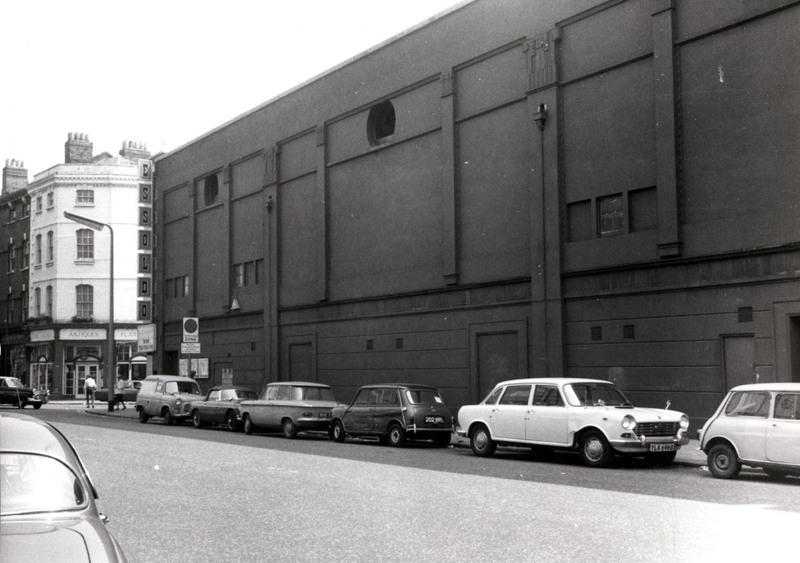 Look at this blank wall from the 1970s, well before shops colonised part of this frontage. Cinemas are known for changing of course. One screen becomes several as the grand auditoriums shrink. Names change frequently. This cinema has been known by a confusing variety of names in its time, some of which I’ll mention here, some of which I’ll miss. But I do have a few pictures. (And let me apologise if I’ve used some of them before, even recently, but it’s good to get the pictures all in one post.) When I first lived in Chelsea I knew it as the Classic (I was used to the notion that every city had a Classic, an ABC, and an Odeon), but that wasn’t its first name. According to a reliable source, it opened in 1910 as the Palaseum, then became the Kings (1911) and the Ritz (1943). In 1949 it became the Essoldo. Here it is under that name. What was on that week? Well I can’t help this close up. “Can Hieronymous Merkin ever forget Mercy Humpe and find true happiness?” was a vehicle for writer/director/star Anthony Newley (“What kind of fool am I……. ?”), featuring Joan Collins and even Bruce Forsyth. Now forgotten, perhaps mercifully. 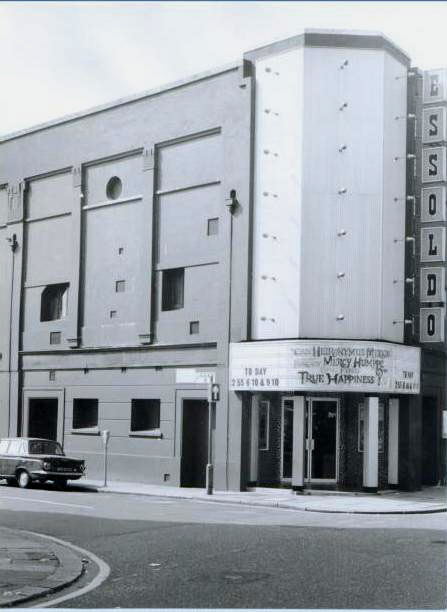 Later (1972) the Essoldo became the Curzon, showing an Oscar winning film in “continuous performance”. 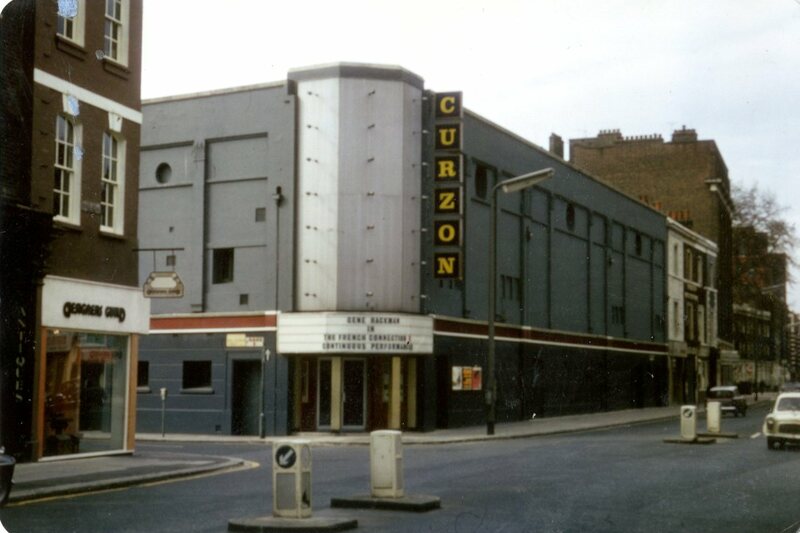 But the Curzon didn’t last long. 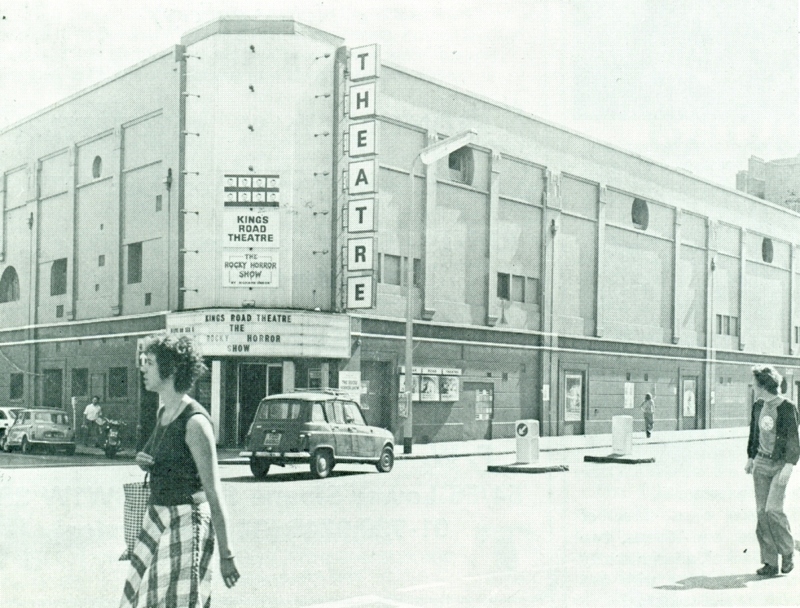 Here it is as the King’s Road Theatre, home of the stage version of the Rocky Horror Show, about 1973. And here in colour, on a rainy day. It wasn’t until 1980 that it actually became a Classic, with four screens as in the picture below. But it also served as a Cannon and an MGM, as it is in the picture. Probably it was a Vue too. If you can remember any other names, please leave a comment. A cinema is mainly memorable for the films you’ve seen there. I’ve been to this one a few times of course. I remember seeing the first Scream film one afternoon, and Mona Lisa, and Silence of the Lambs, all with my wife. Then a number of cartoon,s when we were joined by our son. The Lion King sticks out, but there were many others. After the cartoon period there was a time when my son and I went together to see films where lots of things exploded. (His taste for big action thrillers needs no explanation, but I always wonder if it has anything to do with the time when I took my wife, only about a week from her due date to see the original Lethal Weapon at the other local cinema, in Fulham Road). I even took him to his first 18 film, Blade 2 at this very cinema. (He was not far off 18, I would have said at the time, if I’d been asked) Children grow up fast so the father-son visits only occupied a short period of time, and I admit that the last time we went to a film together it was at the multi-screen place at Fulham Broadway, so I can’t claim to have been a faithful supporter of any particular cinema. And I hardly go at all now, like many of my contemporaries, so it would hardly be fair for me to complain that this building has gone. But it is still worth marking its passing. I don’t know what will come next for this site. 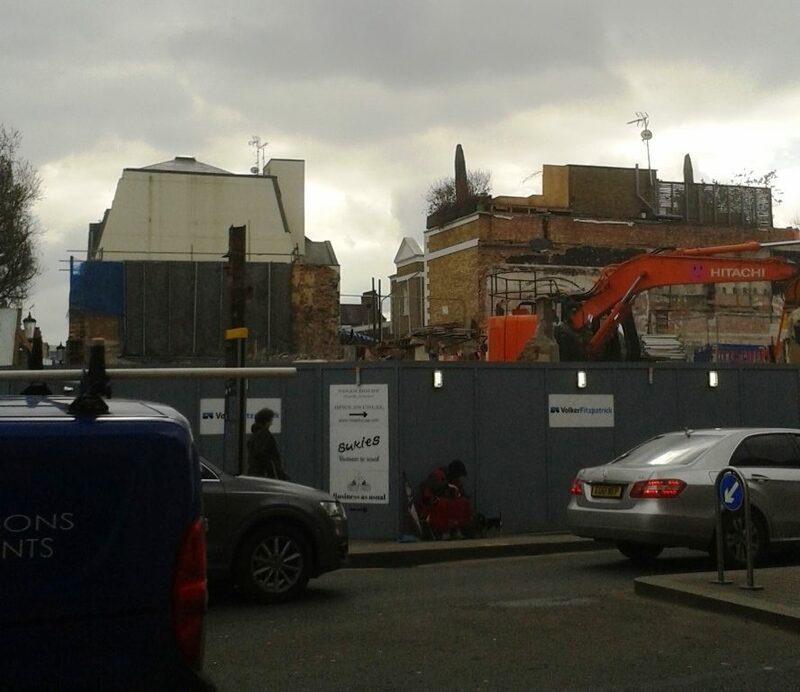 A researcher I met last year told me that there may well be a new cinema on the site as part of the development, but let’s wait and see. Back to the beginning, a picture I had quite forgotten about until I found it this morning. 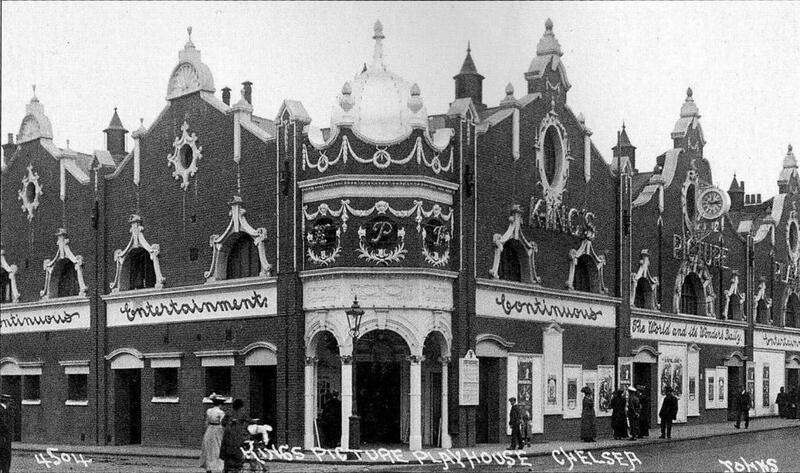 The Kings Picture Playhouse in the early years of another century. And here a ticket from the not so cheap seats. 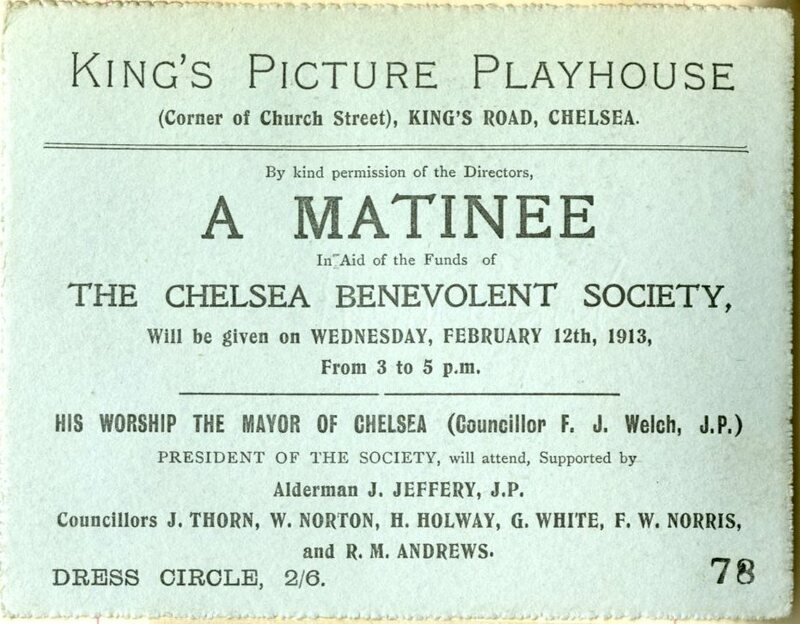 Finally, a reminder of another Chelsea cinema. 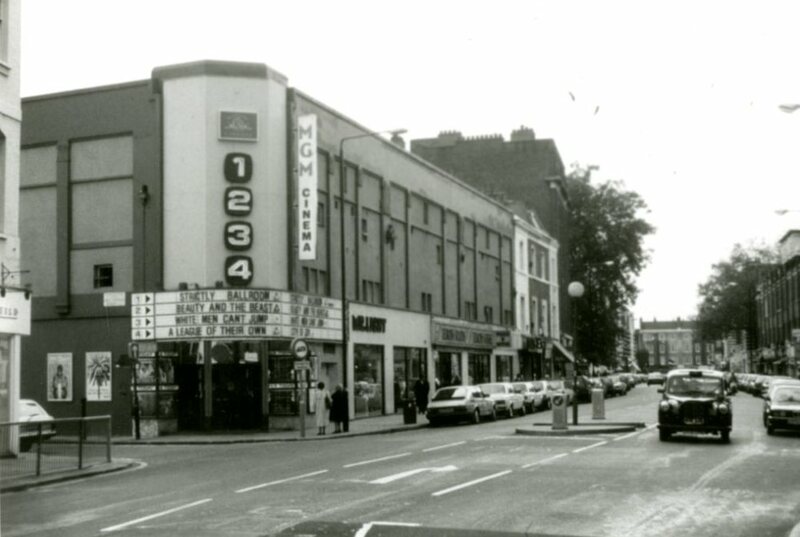 The Odeon, formerly the Gaumont, now Habitat, and the Chelsea Cinema. 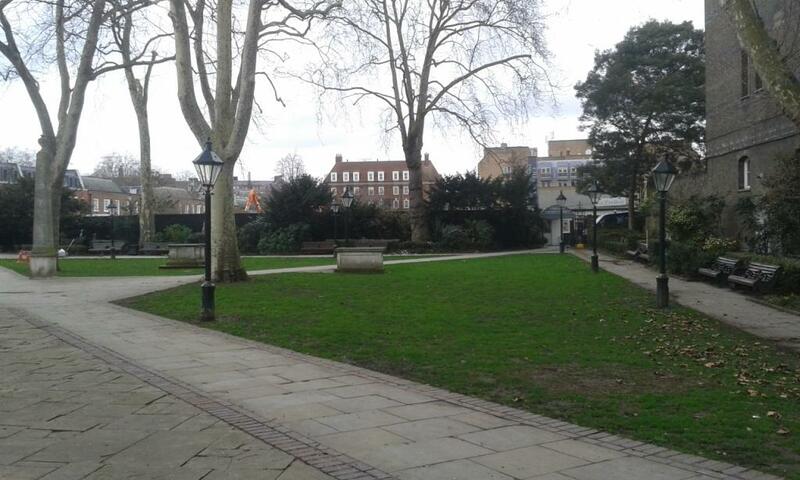 While we were out on Tuesday, we also stopped to take a look at the site of another absent building, the former old people’s home in Dovehouse Street, which was built on the site of Chelsea Workhouse, which we saw last week. My wife had unpleasant memories of the building – as a Brownie she and her pack had once trailed through a series of depressing rooms there singing Christmas carols to residents. I normally only mention the deaths of famous people if I feel I have some connection with their work, which is why I have mostly noted the passing of musicians or authors. It was sad to hear of the death of Professor Stephen Hawking but I can’t claim to have been particularly interested in his work (apart from his occasional appearances in Big Bang Theory). I was once waiting for the lift in the basement of Chelsea Library, back in the 1990s or early 2000s. The lift opened and there he was, with a small entourage, on his way I assumed to attend a wedding in the Register Office. Not a little dumbfounded by the sudden appearance of a famous person, I stepped silently to the side and allowed his group to pass, briefly perhaps sharing eye contact. That’s all there is to my Stephen Hawking story. May he rest in peace. And Ken Dodd. No fleeting memories there but I do remember his radio show from the 1960s. What a wonderful day for publishing a new blog post. 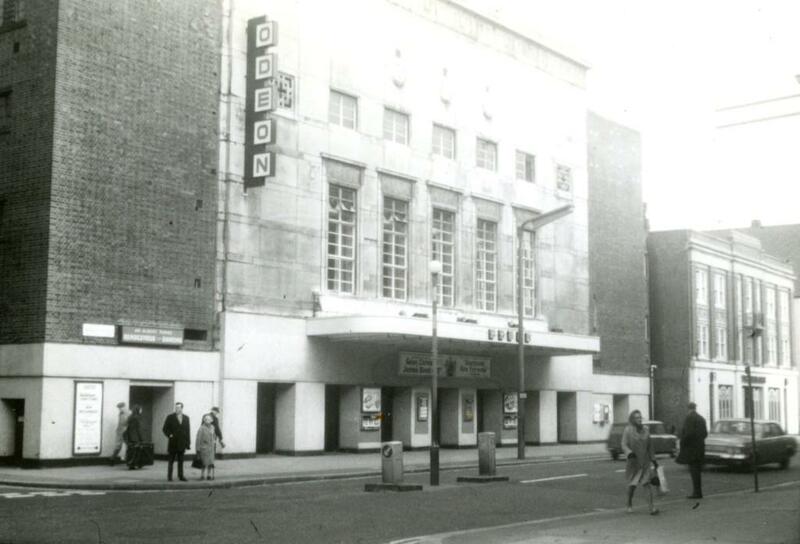 This entry was posted on Thursday, March 15th, 2018 at 11:59 am	and tagged with Classic Cinema, Essoldo Cinema, King's Road and posted in 20th Century, Chelsea. You can follow any responses to this entry through the RSS 2.0 feed. The Kings Road Theatre with the Rocky Horror Show! It was so much fun, although the sound system couldn’t take the high volumes in the songs, so there was loads of distortion as they sang the Time Warp,etc.. But who cared? It was sooooo ground breaking in it’s day! This is amazing. I love old photos and enjoy the history so much. 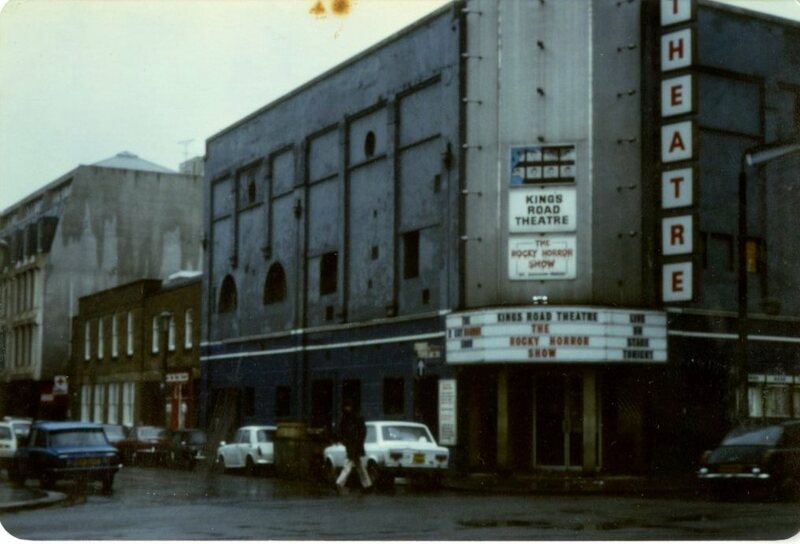 My first ever theatre experience was Rocky Horror on Kings Road.